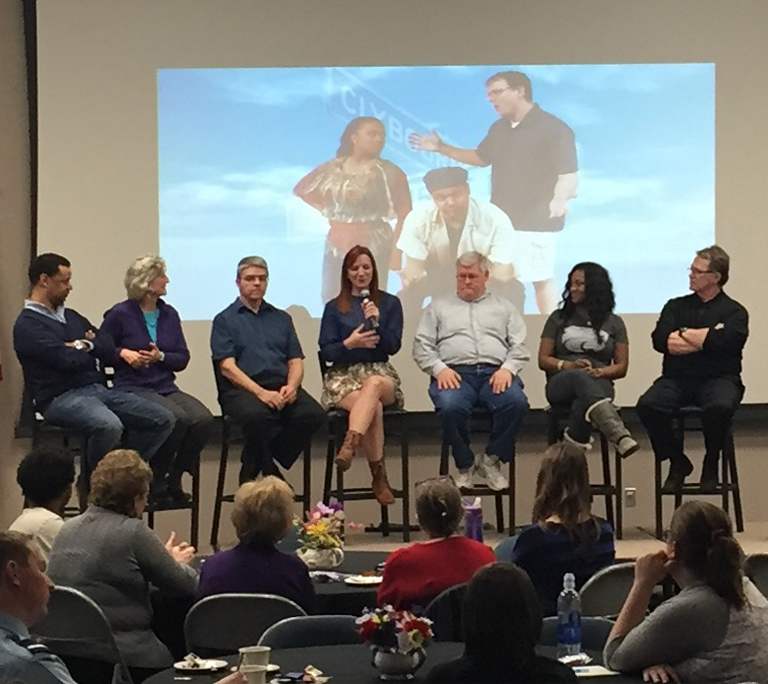 Cast members of Salina Community Theatre’s production of Bruce Norris’s play Clybourne Park were invited to speak to an audience of more than 100 at Kansas State University-Salina’s Diversity High Tea on Monday, January 26. This Pulitzer Prize- and Tony Award-winning show, playing February 13-28 at Salina Community Theatre, deals with issues of race, neighborhood, economics, and gentrification. The action takes place in two acts set fifty years apart. The first act is set in 1959, as nervous community leaders anxiously try to stop the sale of a home to a black family. The same house in the present day is the setting for the second act, as the now predominantly African-American neighborhood battles to hold its ground in the face of gentrification. Clybourne Park’s director David Grieser, SCT Executive Director Michael Spicer, and five cast members answered questions posed by Access TV’s Executive Director Marnie Rhein. Keenan Ramos, Twila Schneiders, Gary Demuth, Brenna Downs, and Kesha Harrel-Davis fielded questions about the difficulties of creating characters who are dealing with such sensitive and explosive issues. The session was followed by questions from the audience. The event was hosted and sponsored by the Multicultural Student Union on the K-State Salina campus. SCT’s production of Clybourne Park is sponsored by K-State University Salina, and is recommended for audiences age 13 and older, due to adult content and strong language. See the article in The Salina Journal.